The film opens in 35,000 BC North Texas. A Neanderthal man stumbles upon what appears to be a large, primal, vicious alien in a cave. The two fight, and the caveman wins, stabbing the alien to death. However, black oil (which we know from the episodes) bleeds from the alien's wounds and soaks into the Neanderthal. After a fade to modern-day small-town Texas, a little boy falls down a hole in his back yard, and finds a human skull. As he picks it up, black oil seeps out from the ground beneath his feet, and black slivers move up his legs until they reach his head — his eyes go black. Shortly afterward, a team of firemen descend to rescue him....however they seem to meet the same fate. A team of biohazard-suited men in a helicopter, accompanied by several others and a man named Ben Bronschweig descend upon the scene. At the end of the fifth season, the X-Files were shut down, and Mulder and Scully were assigned to other projects. They are first seen assisting Special Agent in Charge (SAC) Darius Michaud, and his FBI team investigating a bomb threat to a Federal building in Dallas. When Mulder separates from the team to scout out the building across the street, he discovers the bomb in a first-floor vending machine. While Michaud remains to disarm the bomb, Mulder and Scully are able to evacuate the building and prevent hundreds of casualties before it explodes. It becomes clear to the viewer, (but not the agents) that Michaud is making no effort to disarm the bomb, which ultimately explodes. Mulder and Scully return to Washington DC., but instead of being commended for their roles in preventing the deaths of hundreds, they are instead chastised because four victims were still in the building: three firemen, and one little boy. They are both scheduled separate hearings in which their job performance will be evaluated. That evening, Mulder encounters a paranoid doctor, Alvin Kurtzweil, who explains that the four victims were already dead, and the bomb was allowed to detonate to destroy the evidence as to how they died. Mulder enlists Scully to travel with him to the morgue to examine the bodies. They learn that the bodies have suffered a complete cellular breakdown which could not have been caused by the bomb. Mulder leaves Scully in the morgue to fly back to Dallas to investigate evidence left from the explosion. He urges Scully to join him, and she shares evidence that the bodies were infected with an alien virus. They travel to the boy's home and find a brand-new park in place of the hole in which he fell. Unsure what to do next, they follow a team of tanker trucks to a massive cornfield surrounding two bright, glowing domes. When they infiltrate the domes, they find simply a large empty space. However, grates on the floor open up, and a massive swarm of thousands of bees chase the agents into the cornfield. Soon black helicopters fly overhead, and the two make a harrowing escape back to Washington. Mulder awakens in a hospital (the bullet grazed his temple), and, with the help of The Lone Gunmen, sneaks out of the hospital. He is accosted by The Well Manicured Man, who gives him Scully's location in Antartica, along with a weak vaccine to combat the virus she is infected with. The Well-Manicured Man then kills his driver and himself before his betrayal of the syndicate can be discovered. Mulder journeys to Antarctica to save Scully, in the process discovering a massive, underground secret lab run by the Cigarette Smoking Man and his colleague Strughold. Mulder revives Scully with an injection of a vaccine, disrupting the stable environment of the lab and reviving the cocooned aliens. The lab is destroyed just after they escape to the surface, when the alien ship lying dormant underneath leaves its underground port, launching into the sky. Scully is unconscious while the ship flies directly overhead, and Mulder wakes her in time to allow her a hazy view of the gray ship disappearing into gray leaves; it is unclear whether Scully, in her weakened state, discerned anything. Later, Mulder and Scully attend a hearing where their testimony is routinely ignored, and the evidence covered up. The only remaining proof of the whole ordeal is the bee that stung Scully, collected by The Lone Gunmern. She hands it over, noting that the FBI does not currently have an investigative unit qualified to pursue the evidence at hand. Later, on a bench along The National Mall in Washington, Mulder is appalled by the media cover-up of the entire incident, and tries to persuade Scully to leave his crusade. Scully refuses, noting that "if I quit now, they win." 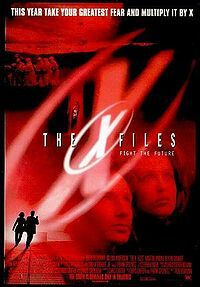 At another crop outpost in Tunisia, Strughold is given a telegram by the Cigarette-Smoking Man; the telegram informs them that The X-Files have been reopened.